A two-stage SpaceX Falcon 9 rocket launches the Bangabandhu-1 communications satellite from NASA's Kennedy Space Center on May 11, 2018. The same Falcon 9 first stage launched another satellite in August 2018 and is scheduled to loft at least 64 small satellites on the SSO-A rideshare mission, which had been scheduled to launch Nov. 19. Spaceflight history won't be made Monday (Nov. 19) after all. A two-stage SpaceX Falcon 9 rocket topped with at least 64 small satellites had been scheduled to launch at 1:31 p.m. EST (1831 GMT) Monday from California's Vandenberg Air Force Base. "Standing down from Monday's launch attempt of Spaceflight SSO-A: SmallSat Express to conduct additional pre-flight inspections. Once complete, we will confirm a new launch date," SpaceX representatives said via Twitter on Saturday (Nov. 17). They did not offer further details, so it's unclear what issue prompted the call for further inspection. The Falcon 9 first stage that will help loft SSO-A has already flown twice this year. It launched the Bangabandhu-1 communications satellite for the government of Bangladesh in May and the Merah Putih satellite for PT Telkom Indonesia in August. 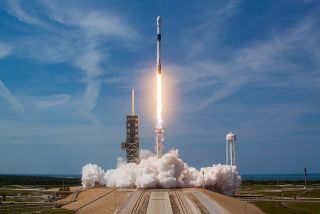 Such reuse is a key priority for SpaceX and its founder and CEO Elon Musk, who aim to slash the cost of spaceflight by flying rockets frequently and repeatedly. A third launch of the same Falcon 9 rocket would therefore mark a significant step toward achieving the company's long-term goals. Along these same lines: SpaceX had been planning to reuse Falcon 9 upper stages as well, but that's no longer in the cards, Musk announced yesterday. "Btw, SpaceX is no longer planning to upgrade Falcon 9 second stage for reusability. Accelerating BFR instead. New design is very exciting! Delightfully counter-intuitive," Musk said via Twitter. The BFR will be a versatile system capable of carrying out all of SpaceX's planned activities, from launching satellites to ferrying people on point-to-point trips around Earth, Musk has said. Indeed, SpaceX aims to phase out its Falcon 9 and Falcon Heavy rockets, and its Dragon capsule, after the BFR comes online. When SSO-A lifts off, it will carry at least 64 small satellites to low-Earth orbit. These payloads are a diverse lot; more than 30 of them were provided by international organizations that together involve 18 different countries, according to representatives of Spaceflight, the mission-management provider that put the flight together. That crazy satellite total is not an all-time record. In February 2017, an Indian Polar Satellite Launch Vehicle rocket launched 104 spacecraft, the vast majority of them tiny "nanosats," to Earth orbit.